TRUE/VH Custom Senior Hockey Skates | Sports Etc. Patented TRUE MonoForm, monocoque design yields more direct power transfer and unmatched control while in stride or using your edges. 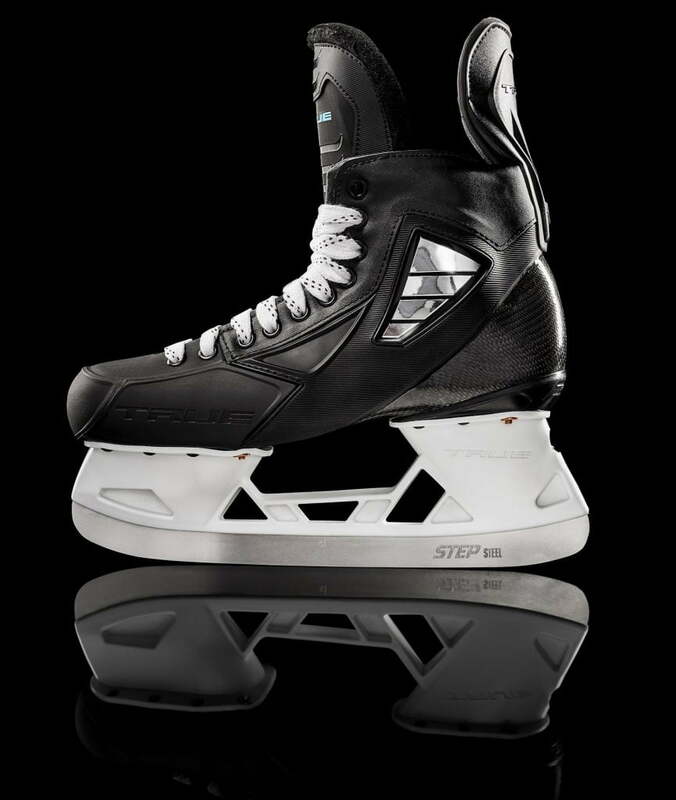 Built from the inside out using a custom 3D foot last shaped to the individual skater’s foot, the thermoformed boot locks in the foot, eliminating loss of energy and producing unrivaled power, comfort, and control. A truly pain-free skating experience for anyone with foot issues. The patented TRUE tendon guard provides optimized flexibility and stability in every stride for a more direct and fluid power transfer. The strategically placed eyelets unlock an optimized knee-forward position, facilitating natural and more direct energy transfer and maximum power in every stride. The antimicrobial and hydrophobic liner wicks moisture to the venting holes to keep the feet dry and comfortable. Averaging 18 seconds per holder, BenchChange technology allows for fast blade replacement via TRUE’s magnetized blade change tool provided with each pair of skates. Made in Canada with only the finest raw materials, the best-in-class StepSteel blade carves through the ice with precision and power. Come in to Sports Etc and have the professionals take a 3D scan/image of your foot with TRUE’s patented technology. TRUE will then custom build the skate around your foot specifications in only 3.5 weeks! Sports Etc Performance To Value Rating– 10 out of 10– One of the best skates available for elite level goalies looking for a performance skate. A truly one of a kind, 100% custom goalie skate.